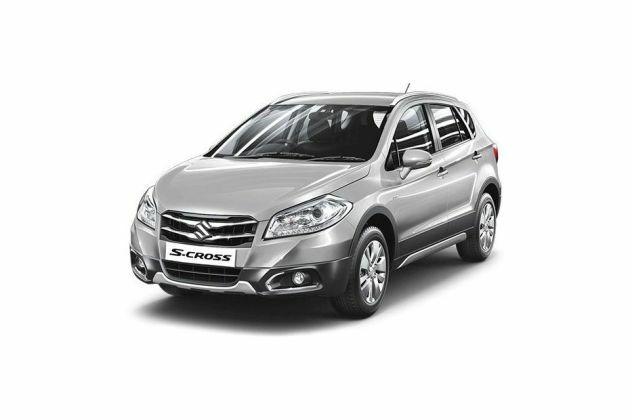 Maruti S-Cross DDiS 200 Zeta is the mid range diesel trim in its model series. It comes with a muscular frame and a sloping roof that makes it look sportier. At front, it has a bumper equipped with silver garnished skid plate and a large headlight cluster integrated with turn indicators. The side profile has body colored ORVMs as well as a set of alloy wheels, which are fitted to its neatly carved wheel arches. Meanwhile, its rear profile includes some noticeable aspects like split combination lamps, and a stylish boot lid that is further embossed with company's emblem. Its interiors too, are decorated in a splendid way with an attractive color scheme, whereas the chrome accentuation further enhances its appearance. It comes with well cushioned seats, which is foldable in the rear. An automatic air conditioning unit is offered, while it has power operated windows with auto up and down function on the driver's side. Furthermore, aspects like sun visors, tilt adjustable steering wheel, keyless entry and a few others enhance its passengers' convenience. On the safety front, it comes with a rigid TECT body structure, dual horn, seat belts, driver seat belt reminder and so on. In terms of technical specifications, it has a 1.3-litre diesel engine that is based on a DOHC valve configuration. This can belt out a peak power of 88.5bhp in combination with torque output of 200Nm and returns a decent fuel economy. This premium crossover is designed with an overall length of 4300mm along with a width and height (including roof rails) of 1765mm and 1590mm respectively. It has a wheelbase of 2600mm, whereas its minimum ground clearance comes to 180mm. Talking about its looks, it is quite swish with several remarkable aspects. Starting with its rear end, there is an expressive boot lid with the firm's badge engraved on it. Surrounding this are split combination lamps, which are equipped with turn indicators. Then, there is a wide windscreen as well as a bumper that further has a skid plate fitted beneath it. At the front, the chrome plated radiator grille is flanked by a neatly designed headlight cluster that is integrated with high intensity lamps. The windshield has a couple of wipers fitted to it, and there is a skid plate in its frontage as well. Meanwhile, the bumper includes a large air intake section that cools the engine quickly. Coming to its side profile, it has neatly carved wheel arches equipped with a set of 16 inch alloy wheels. These rims are covered with tubeless radial tyres of size 205/60 R16 that provide an enhanced grip on roads. Apart from these, it also comes with body colored outside rear view mirrors, door handles as well as B-pillars that completes its side profile. The appealing interiors are one among its several highlights, which is packed with various interesting aspects. To begin with its cockpit, there is a well designed dashboard that includes a tilt steering wheel, stylish center console as well as air vents. Also, it has a TFT information display with a trip meter and notifies about fuel consumption, outside temperature and other updates. It has a reclining rear seat with 60:40 split folding function, while the driver's seat comes with height adjustment facility. The glove box compartment is illuminated, whereas the front seats have back pockets. In addition to these, there is also driver side foot rest, sliding front center armrest with storage, luggage board, dual side operable parcel tray, sunglass holder and many other such useful aspects. It is powered by a 1.3-litre, DDiS 200 diesel mill that displaces 1248cc. It comes with four cylinders and is based on a DOHC valve configuration. This motor is capable of producing a maximum power of 88.5bhp at 4000rpm besides delivering torque output of 200Nm at 1750rpm. It is paired with a five speed manual transmission gear box. This power plant helps in returning a maximum mileage of around 23.65 Kmpl on the bigger roads and nearly 18 to 19 Kmpl within the city. It takes approximately 13 to 14 seconds to break the speed mark of 100 Kmph from a standstill and attains a top speed of about 155 to 160 Kmph. A proficient McPherson strut is affixed on its front axle, whereas a torsion beam is assembled on the rear one. Moreover, both these axles come loaded with coil springs that further makes the drive smoother. In terms of braking, ventilated disc brakes are fitted to its front wheels, whereas solid disc brakes are used for the rear ones. On the other hand, it comes with a tilt and telescopic adjustable steering column that simplifies the vehicle's handling in any road condition. This trim is bestowed with numerous comfort aspects such as keyless entry, cruise control system, engine push start/stop, seven step illumination control, inside rear view mirror and a few others. It has an smartplay infotainment system that supports USB port, Aux-In and Bluetooth connectivity. The controls of this unit are mounted on steering wheel for driver's convenience. The automatic air conditioning unit comes with dust and pollen filter, while there are power operated windows with auto up and down as well as anti pinch functions. Besides these, it has rear center armrest with cup holders, sunvisors with vanity mirror lamps, and front accessory socket as well. The list further includes navigation system, bottle holders on door trims, electric back door opener, luggage board, front footwell illumination and a few others that adds to the comfort levels. Its passengers are guaranteed enhanced security through some significant aspects like dual horn, anti theft security system, driver and passenger airbags, reverse parking camera, engine immobilizer, and anti lock braking system. Apart from all these, it also comes with reverse parking sensor with display, driver seat belt reminder with buzzer, TECT body structure, central locking system, as well as seat belts with front pretensioner and force limiter that maximizes the level of passenger security. 1. Roomy interiors with comfortable seating arrangement. 2. Sophisticated audio unit is a plus point. 1. Absence of leather seat covers. 2. Exteriors could have been more attractive.